"Superior" brand Weissenborn style guitars any good? Topic: "Superior" brand Weissenborn style guitars any good? One of these popped up for sale in town. I'm not familiar with these guitars or the brand. Does anyone have any opinions and experience with these? I have one and I like it. I own one, too. I changed a few things like the funky flared nut and I installed different tuners (similar to the ones on the guitar you are considering). The string spacing is a bit wider on these, but I like it. 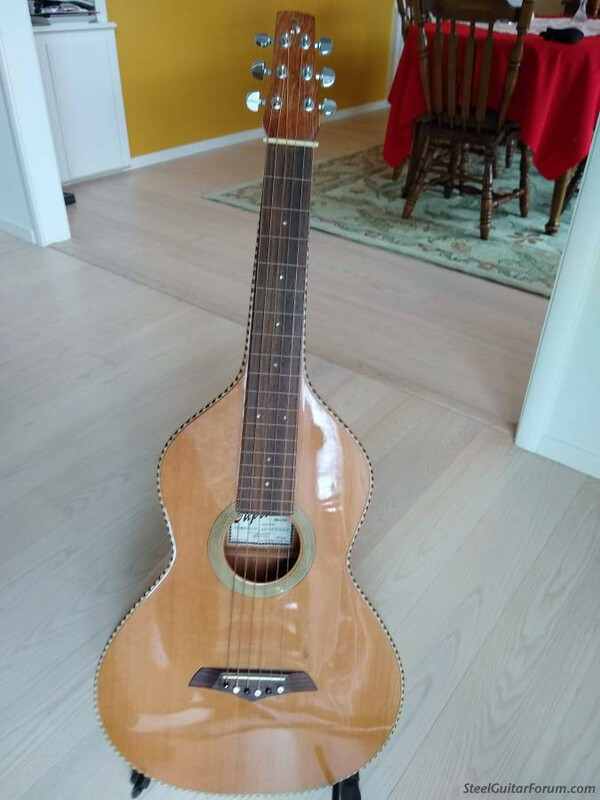 Mine is a spruce top with palo escrito sides and back (probably has a different sound than the one you're looking at). 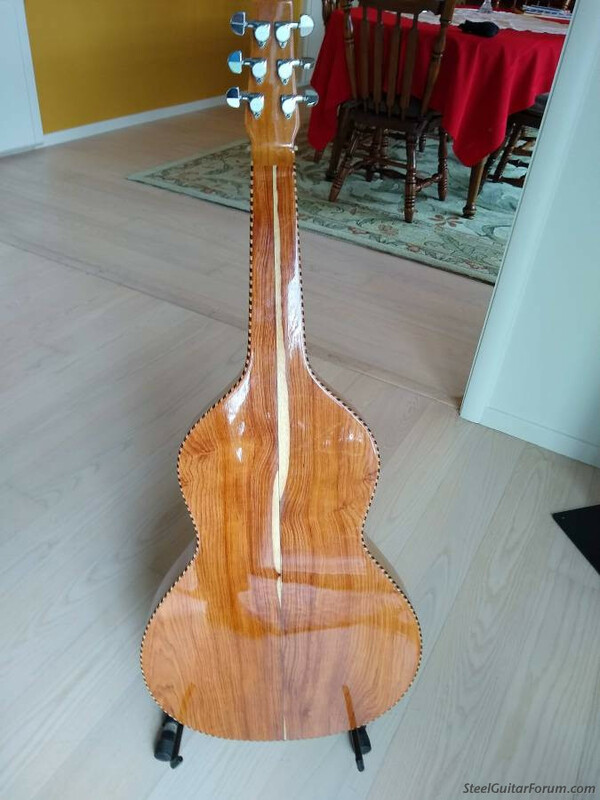 They (Berkeley Instrument Exchange) still sell these for about $1200 new. They are hand crafted in Mexico, and like Erv I find mine to be good bang for the buck. I also had to have the flared nut corrected. I have two pickups on mine, a Sunrise magnetic pickup and another pickup underneath the bridge. I have a stereo jack so I can run a stereo cord to my Marshall acoustic amp and put the signal into two different channels and adjust the input. Very good sound. Oooo ... a cedar top, Grover tuners, rope binding, M1 installed ... what's not to like about that? When I got mine, I was surprised how light they are. Mine only weighs 3 pounds. He wants only $600 for it. Shows a little wear...Looks like a good deal! So ... are you the current owner of this one, Dave? If so, what do you think of yours? Life is unjust, we do not deserve our good fortune, and so it behooves us to be quiet about it. i bought one back around 2000 or so--whenever they first came out. the only problem i had was the string spread at the bridge, which was inordinately wide and thus required mental- and muscle-memory adjustments to be made when going from my more normally spaced steels to the superior; slants were a nightmare. i finally had my fine luthier kerry char put on a new, conventionally-spaced bridge, saddle, & nut--now all is right with the world. otherwise, a fine piece with excellent sustain and tone. for all i know, the company may have since corrected this problem. I recall playing some of the early versions at the shop in Berkeley and I didn't care for them. I'm guessing the quality has evolved since some of the folks here have good things to say about them. I have one, a deep body model. It sounded good but the finish kind of sucked with a lot of 'orange peel'. upper left bout and the rope binding on the top. It is slowly crawling towards the neck and is about 1/16th" wide and 3" long at the moment. I tried but could not get the crack to close so it can be re-glued. Having a luthier do it would cost more than it is worth. I put some glue into the crack hoping it would help. It didn't. I've kept it tuned to FACFAC all the time so tension wouldn't have done it. I'd sell it but I don't think there is much demand for a 'pre-cracked' guitar. Posted 4 Apr 2019 11:43 am superior weissenborn. ADDENDUM: i also had kerry char put on a wire saddle, which improved the tone considerably. 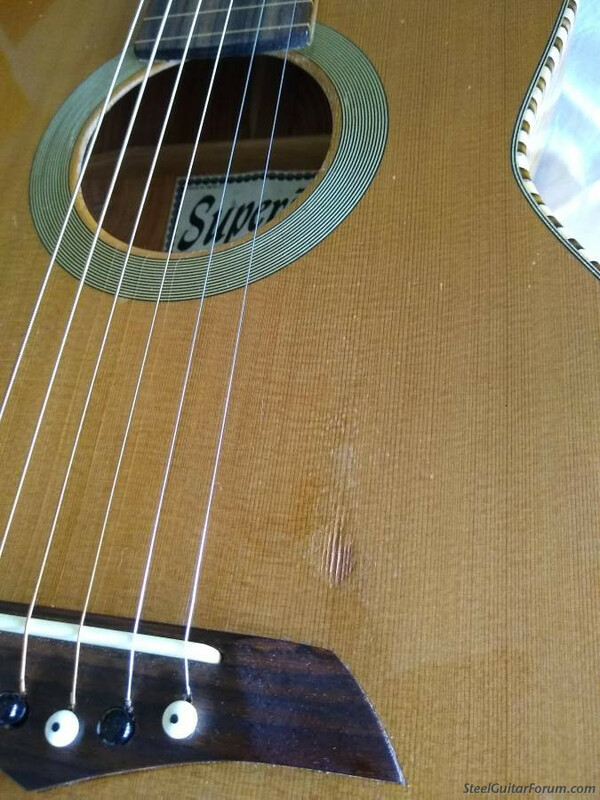 it was my travel guitar for many years, traveling with me all over the world and spending much of its time on a normally either frozen solid or hideously over-heated truck awaiting lunch-time jam sessions. the finish cracked, but it still holds together. Art has been debauched to ornament, and science has been prostituted to the multiplication of gadgets. I seem to remember that when these came out, many people were commenting on the wide spacing, and that issue was later addressed? That back looks amazing, though. Almost like koa. When I got my Superior, it had the goofy looking nut but I had a luthier take care of the problem.